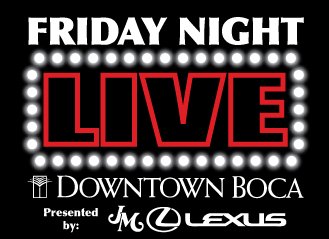 About 10,000 South Florida residents and visitors, from all Miami to the Treasure Coast, flocked to Downtown Boca, “where Boca and Brazil planned to meet to celebrate the Brazilian Beat” as the destination presented this month’s Friday Night LIVE! salute to Brazil’s Independence Day with free, open-to-the-public festivities. 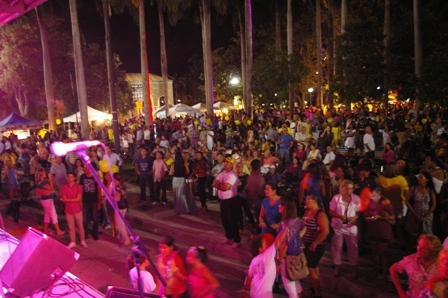 Event-goers of all ages were dancin’ in the streets, enjoying the live Brazilian music and entertainment, including award-winning singer Rose Max and fan-favorite Batuke Samba Funk. The packed spirited schedule also featured Capoeira dancers, Carnival drummers and dancers, a Zumba demonstration, DJ Fred, shopping, dining, art, fashion and more. The popular Gourmet Truck Expo with café seating, Potions in Motion and Baja Café with Leblon served up Brazilian favorites as participating businesses extended hours for exploring and enjoying the destination, from Mizner Park to Royal Palm Place, including the signature collection of shops and boutiques, restaurants and galleries. 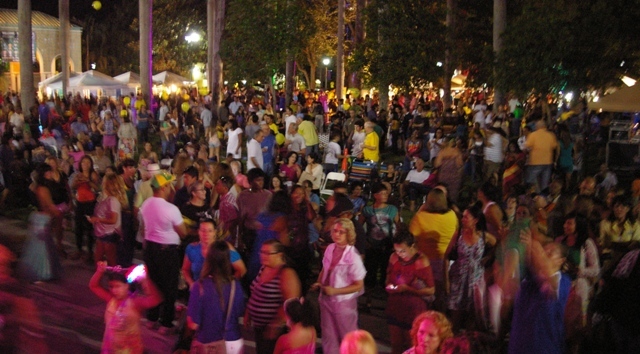 Downtown Boca and the City of Boca Raton hosted the festivities in partnership with the Consulate General of Brazil in Miami, the Palm Beach County Convention & Visitors Bureau, Friday Night LIVE! series presenting sponsor JM Lexus, Banco do Brasil as the evening’s Official Programming Sponsor, plus the Rotary Club of West Boca Raton, Leblon, Café Brasil 88.9 FM, Boca Tribune, Gazeta Brazilian News and Acontece Magazine. During the evening, Boca Raton Mayor Susan Whelchel alongside Deputy Mayor Susan Haynie and Community Redevelopment Agency Chair and Council Member Constance Scott welcomed Ambassador Helio Victor Ramos, Consulate General of Brazil in Miami and presented him with the key to the City of Boca Raton and a proclamation. Following remarks from the Ambassador, both the Star-Spangled Banner and the Brazilian National Anthem were played. Batuke Samba Funk, a unique collective of musicians from Brazil and Miami, then took the stage to perform the classic samba/soul sound originating in Rio de Janiero in the late 1960s. The group combined the percussive grooves of Brazilian samba with the funk rhythms of American legends like James Brown and Earth, Wind & Fire. Batuke Samba Funk was founded in 2008 by bassist extraordinaire Diogo Olivera and features a revolving cast of the very finest musicians playing guitars, bass, drums, vocals and Afro-Brazilian percussion. As a signature element of the show, the band erupted into a samba jam session using traditional Brazilian drums as well as recycled objects such as cans, buckets and scrap metal to create a joyous carnival atmosphere. Rose Max, “South Florida’s favorite Brazilian singer,” followed Batuke Samba Funk with her mesmerizing guitarist Ramatis Moraes. They “fired up” the streetside dance floor with authentic, classic samba music inspired by the nightclubs of Rio de Janiero accompanied by a pulsating band and a lively percussion section. Max’s talent and performance has earned her several Miami New Times “Best of” awards as well as three Brazilian International Press Awards. 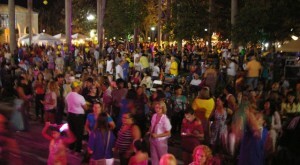 For the full photo gallery from the evening and updates on other Downtown Boca news and upcoming events such as the free, family-friendly Meet Me On The Promenade: Downtown Boca two-night, one-day street fest with plenty of Halloween Happenings! programming on October 26th and 27th, visit www.DowntownBoca.Org often, become of a Facebook fan at http://www.facebook.com/DowntownBoca or call 561-367-7070.